The scientific accurate simulation of the colour effects presented the biggest challenge in the creation of Captain Einstein, but it was also quite rewarding as it resulted in some surprises. Here we expand in a bit more detail on these colour effects. A good starting point is the pure colour blue, produced by light consisting of a single wavelength of 475 nm. As a first approximation we can then model the blue sky simply as a giant sphere of pure blue. Imagine now that we start driving our boat with a certain velocity. In the figure below you can see the observed colours for three different velocities: zero velocity, 40% of lightspeed, and 85% of lightspeed. At zero velocity, we have of course the same colour blue in all directions. If we then start moving, the Doppler effect will shift the blue waves towards larger or smaller wavelengths, depending on the direction. This results in the characteristic colour pallet of a rainbow. From UV to IR, through the visible spectrum. Notice that at 40% of lightspeed it is pitch black at the front of the boat: for θ smaller than about 50° the original blue light is Doppler shifted beyond the visible wavelengths (390-700 nm), into invisible ultraviolet (UV) radiation. For a similar reason, there is not much light at the back. Now the blue light gets Doppler shifted to the boundary between the visible and invisible infrared (IR) radiation. At 85% of lightspeed the picture is quite similar, but with a much narrower range of directions of visible light. By the way, UV radiation is indeed invisible to our eye, but it wouldn’t go unnoticed. It would burn our skin for instance. For obvious reasons we restricted ourselves to the purely visual effects in our simulations. In the VR movie we start with our boat driving at 40% of lightspeed (8km/h in the Captain’s world) and after the second acceleration we are going at 85% of lightspeed (17km/h). Yet, the Doppler shifted blue sky does not look at all like in the figures above! The reason lies in the difference between the dull pure blue light and the incredible rich blue sky that consists of a full spectrum of different wavelengths, starting in the UV and ending deep into the IR part of the light spectrum. The Doppler effect on such a realistic blue sky spectrum produces the characteristic colour pallets below. 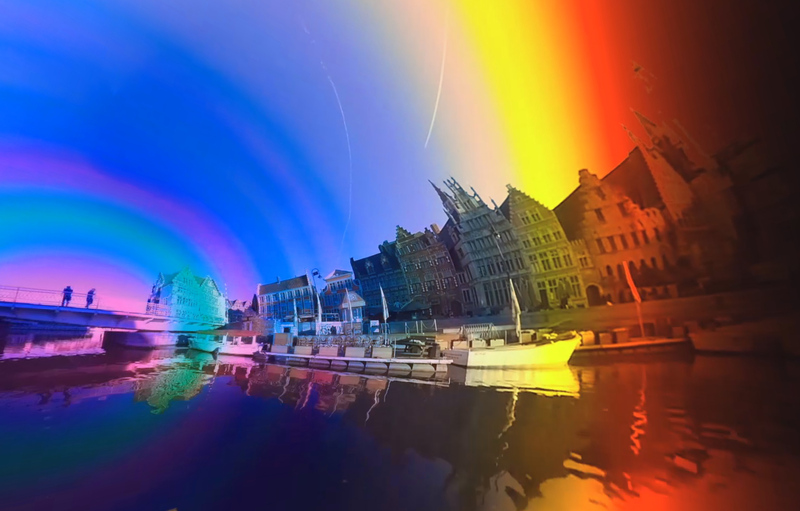 The colours arise from the various parts of the blue sky spectrum, including the UV and IR part that would normally be invisible: depending on the direction and velocity, different portions of the spectrum are Doppler shifted into the visible window. The different portions of the blue sky spectrum that become visible at 85% of lightspeed. In the next figure we illustrate this on a point of view shot at 85% of lightspeed. For some specific directions in the sky we show the part of the original spectrum that gets Doppler shifted into the visual window, producing the particular colour in that direction. One can now understand why the dark behind us is not a black hole. It simply gets dark because the blue sky does not have much UV radiation at wavelengths smaller than 300 nm. The colours in front of the boat originate from different parts of the IR radiation. 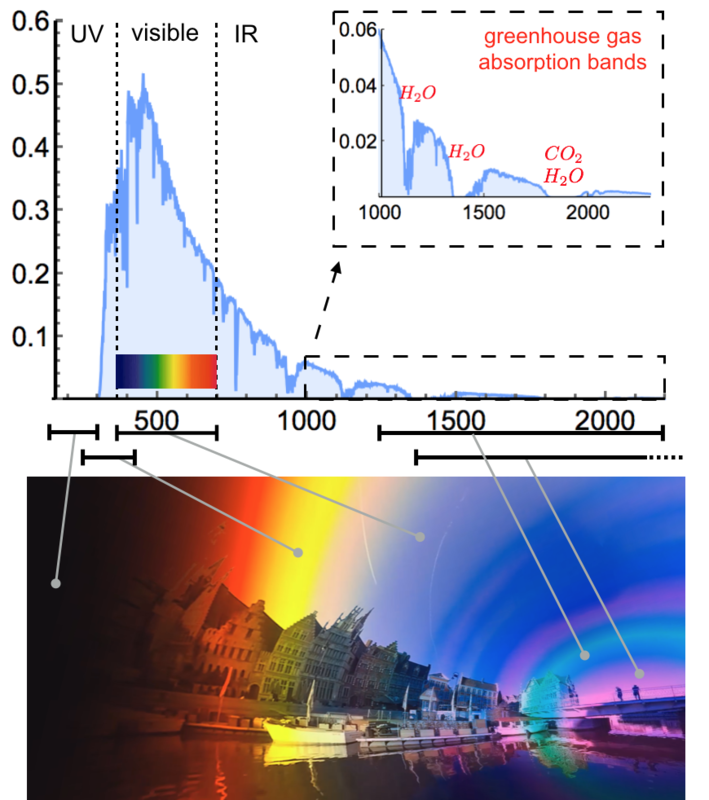 This IR spectrum shows different bands of wavelengths that are absorbed by the various greenhouse gasses. 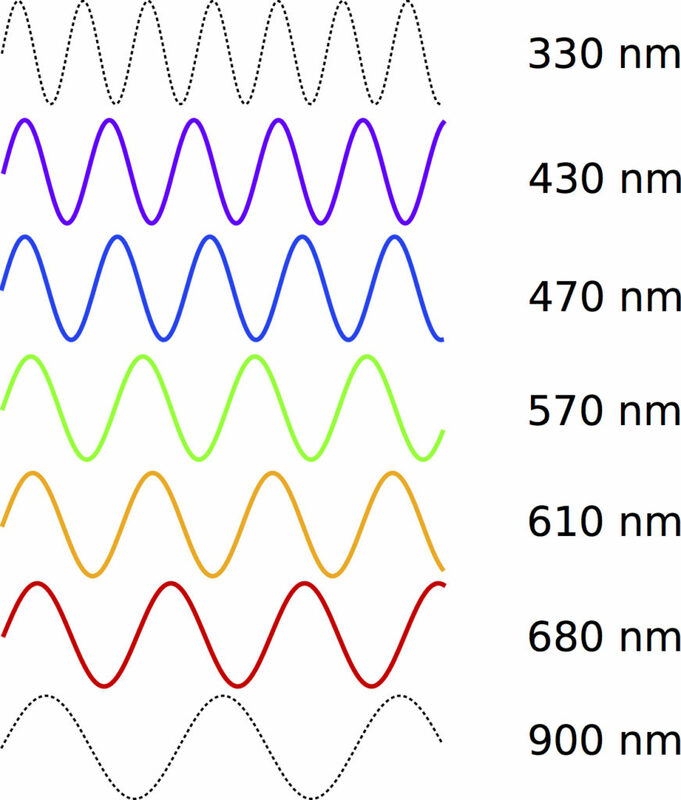 It are these absorption bands that produce the crazy rainbows in the movie, with for instance the different blue and purple bands in the picture. So by going at relativistic speeds one can actually see the greenhouse effect. We’d like to think that Einstein would have been amused with that.